And, perhaps a related question is: why do so many people dislike grammar, to the point where the dislike spreads to grammarians and English teachers and – dare I add – business writing consultants? Two weeks ago, I coached a highly successful pharmaceutical scientist. He apologized profusely for his “poor writing.” After some probing, I realized his writing ability is quite good. His analytical skills are exceptional. He made two consistent grammar errors, which were easily corrected. Too often, I meet with technical people who believe they will never “become good writers” because of self-defeating perceptions, fostered by easily correctable grammar issues. Some business writing consultants recommend that business writing be organized primarily by a “GPS” process, based on G=Grammar, P=Punctuation, and S=Syntax. In business writing, content is critical. If we write a status report with perfect grammar, syntax and punctuation, but omit a software defect from the report, the cost implications, errors, and team impact is exponential. If we write a sales letter that is grammatically perfect, but reflects a smug tone, we alienate a potential client. A customer service letter that omits the action needed to resolve a customer dispute, no matter how grammatically perfect, still fails. Grammar and syntax and punctuation are the backbone of language structure. These rules allow each of us to speak and write our common language. Language is continually evolving, which makes it so interesting. I do not mean to imply that grammar is not important. Grammar is very important. But, a full mastery of grammar alone does not mean one is an effective business writer. 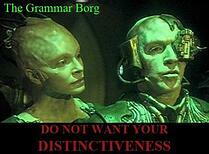 Conversely, grammar errors are very easy to train away. Audience perception, content, organization, structure, and style and tone and grammar all matter. And, of all these requisite skills, grammar is the easiest to correct. It’s simply a matter of learning correct rules and then establishing a habit of practice for that rule in your writing. I believe we impede business writing when grammar takes precedence over other equally important elements of business writing. And, we alienate many business people from enjoying writing when we professionals wield smarmy judgment along with our red correction pens. Grammar is an important element in writing. It’s part of a writing process that all business people can learn to manage well, along with the many other business tasks they so competently manage. If you need grammar training, this course will correct any errors. Do not worry about grammar; errors are easily corrected.